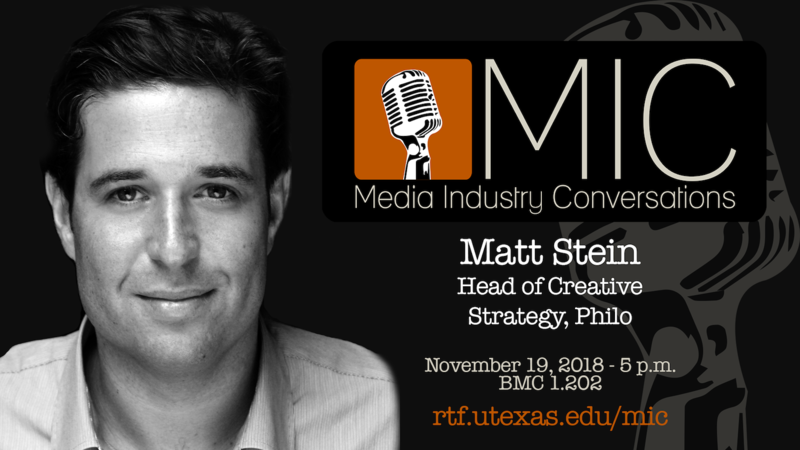 When: Monday, November 19, 2018 - 5-6:15 p.m.
Matt Stein (RTF BS ‘97) discussed his career trajectory, his current roles and responsibilities as the Head of Creative Strategy with Internet TV company Philo, his previous role as Senior Vice President of Marketing, Promotion, & Creative Services at BBC America, and his views on the current state of marketing and promotion in the media industries. Fueled by a passion for problem solving and a commitment to stoking the flames of fandom, Matt Stein has propelled Doctor Who to new heights, led Orphan Black into the pop culture zeitgeist, and overseen successful, groundbreaking campaigns for iconic series that include among others, Mythbusters, Planet Earth, Top Gear, and The Puppy Bowl. In roles at BBC America, Science Channel, Animal Planet and Spike TV, Matt has championed innovative and disruptive approaches to audience development, social strategy, show launches, branded content, and marketing campaigns. He has led multiple network rebrands, and driven organizations to ratings growth and deeper audience connections. A dedicated builder of brands in all shapes and sizes, who embraces the traditional and the cutting edge, Matt loves both making and gut checking data-driven decisions, and lives at the intersection of strategic thinking and creative execution. Currently, Matt is working in the OTT space, with Philo—a television streaming service. He has been with them since they launched in 2017, and oversees consumer messaging and creative, as well as brand partnerships. Despite being a lifelong New Yorker, Matt is a graduate of the University of Texas. He is a certified scuba diver, an excellent amateur chef, and is slowly coming to terms with the fact that he may never be able to dunk a basketball. He currently resides in Brooklyn with his far more talented screenwriter and TV producer wife and two unemployed children, ages 6 and 2.